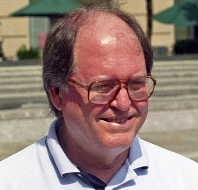 Joe Meadors was selected as the delegate from the United States on the final 1,000-mile voyage to Gaza with the 2018 Gaza Freedom Flotilla. Joe was a signalman on the bridge of the USS Liberty during the 1967 Israeli attack on the boat off the coast of Gaza. down early in the air attack. That flag can be seen at www.ussliberty.org/g/battleflag.gif. He was on the bridge throughout the Israeli attack and was one of several eyewitnesses to the Israeli machine-gunning of the ship’s life rafts. While we mourn the latest unarmed demonstrators ruthlessly killed by Israeli forces in Gaza, we also wish to remember others killed by the Israeli military 51 years ago today. 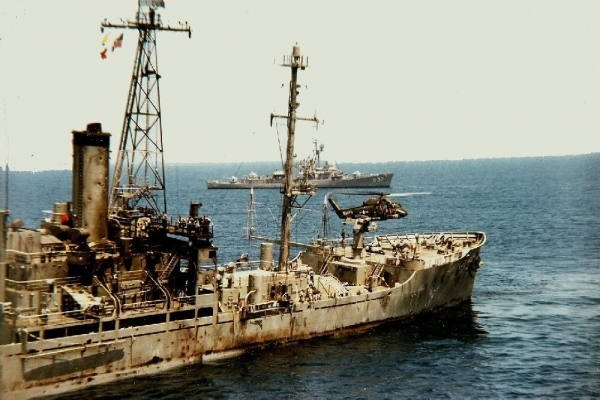 ON JUNE 8, 1967, while patrolling in international waters in the Eastern Mediterranean Sea, USS Liberty(AGTR-5) was savagely attacked without warning or justification by air and naval forces of the state of Israel. Of a crew of 294 officers and men (including three civilians), the ship suffered thirty four (34) killed in action and one hundred seventy three (173) wounded in action. on an operational mission again and was sold in 1970 for $101,666.66 as scrap. At 1400 hours, while approximately about 17 nautical miles off the northern Sinai coast and about 25 nautical miles northwest of El Arish, USS Liberty’s crew observed three surface radar contacts closing with their position at high speed. A few moments later, the bridge radar crew observed high speed aircraft passing over the surface returns on the same heading. Within a few short moments, and without any warning, Israeli fighter aircraft launched a rocket attack on USS Liberty. The aircraft made repeated firing passes, attacking USS Liberty with rockets and their internal cannons. After the first flight of fighter aircraft had exhausted their ordnance, subsequent flights of Israeli fighter aircraft continued to prosecute the attack with rockets, cannon fire, and napalm. 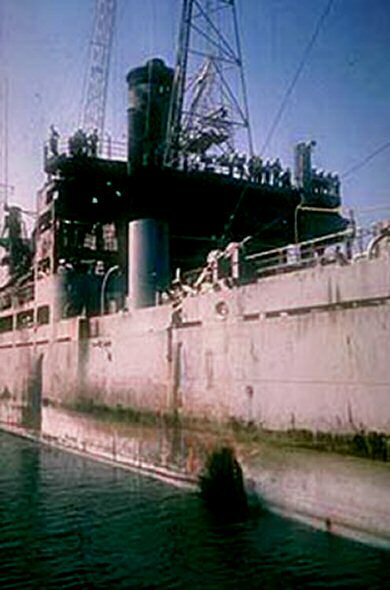 During the air attack, USS Liberty’s crew had difficulty contacting Sixth Fleet to request assistance due to intense communications jamming The initial targets on the ship were the command bridge, communications antennas, and the four .50 caliber machine guns, placed on the ship to repel boarders. After the Israeli fighter aircraft completed their attacks, three Israeli torpedo boats arrived and began a surface attack about 35 minutes after the start of the air attack. The torpedo boats launched a total of five torpedoes, one of which struck the side of USS Liberty, opposite the ship’s research spaces. Twenty-five Americans, in addition to the nine who had been killed in the earlier air attacks, were killed as a result of this explosion. 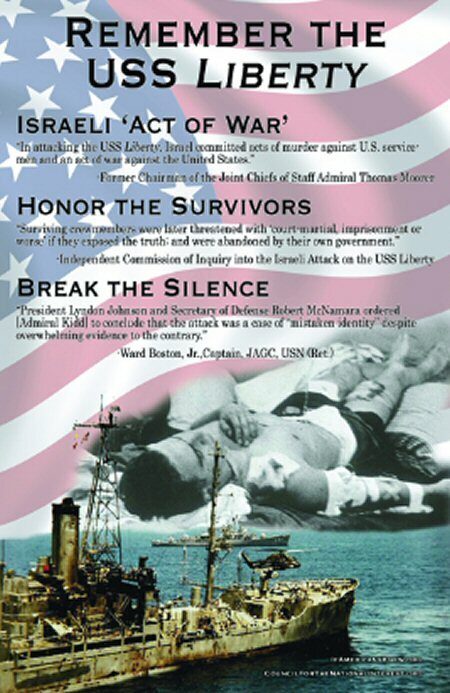 It has been nearly 50 years since the Israeli military attempted to destroy the American naval vessel USS Liberty on June 8th, 1967. The Council for the National Interest (CNI) reports that Israeli forces tried to sink the ship with all men aboard, machine gunned stretcher bearers, and shot up life rafts, killing 34 Americans and injuring at least 174. The captain of the Liberty received the Medal of Honor and, altogether, the officers and crew were awarded two Navy Crosses, 13 Silver Stars, 20 Bronze Stars, nine Navy Commendations, 208 Purple Hearts, 294 Combat Action Ribbons, and the Presidential Unit Citation. Furthermore, according to CNI's statement, another crewman was also a candidate for the Medal of Honor, America’s highest award, but there were too few witnesses left alive to provide the necessary substantiation. Regardless, American Legion officials have prohibited the crew from holding a booth at the national convention, have refused to publish a paid advertisement in the program by a supporter, in addition to trying to convince the VFW to also prohibit a booth. The VFW, however, supports the crew and will again have a Liberty booth at its upcoming national convention. Israeli advocates claim that the attack was a "mistake" and that there have supposedly been "11 US investigations" supporting these claims -- however, the claims have been thoroughly rebutted by numerous authors and the Library of Congress, as well as by relay of an official communication from the US Navy. CNI reports, furthermore, that the crew has the legal right to a thorough investigation of the attack. For thoroughly cited information on this topic, please refer to http://honorlibertyvets.org/. Executive Director of CNI, Philip Giraldi, is a former counter-terrorism specialist and military intelligence officer of the United States Central Intelligence Agency. Alison Weir is an American journalist, founder and executive director of If Americans Knew (IAK) and president of the Council for the National Interest.